Four early-teenaged girls get caught up in a time-travelling war between two factions of the future and get lost in multiple time-streams. They now desperately try to find their way home. I really like Cliff Chiang's artwork on this series. Most comic artists have an issue with a lot of their faces having a similar/the same sort of shape and look. It's a problem across the board with very few exceptions. Chiang's work, while not immune to this problem, is better than most though at creating easy to follow characters, they all have a different look and style which makes them feel real. Even the Grand Father's selection of t-shirts adds a lot to the story in this aspect. He is given a lot to work with here in this story, both with the designs for the clothing and structures of different historical times, but then also getting the opportunity to design futuristic worlds/armour/devices. It's a wonderful project for him to show off what he can do but it must also be inordinately labour intensive and exhausting to be doing this much work on each issue. These are jam-packed pages. 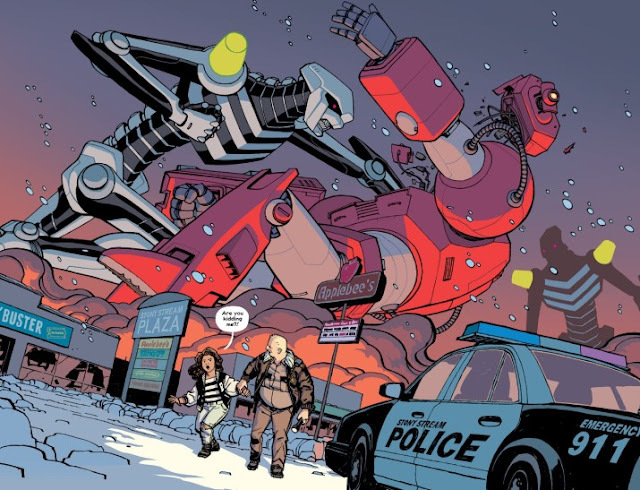 There is a gap in release now for PAPER GIRLS, the next issue is not slated until March next year, and he definitely deserves this prep time. 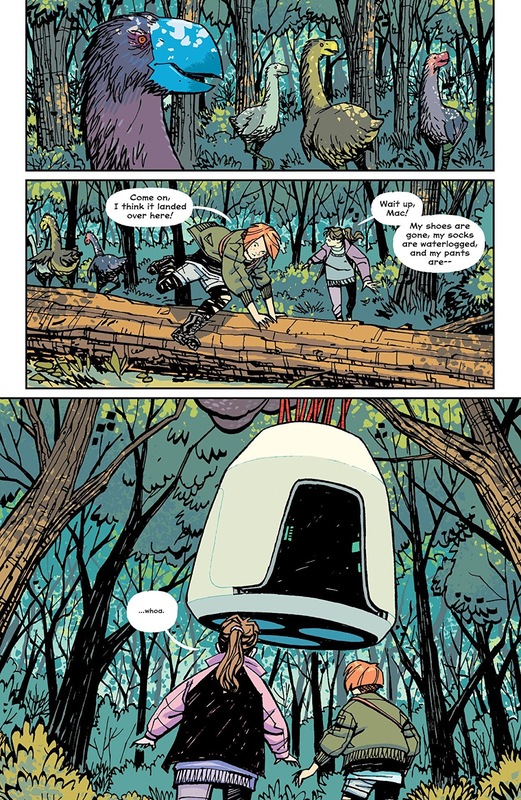 Matt Wilson is one of (if not the) best colourist in the industry right now and his flair for the dramatic with lighting and colour enhance what is already a fantastical journey. Lots of orange, purple, pinks dominate the palette of PAPER GIRLS as can already be evident by the above images. Brian K. Vaughan writes here and compared to my recent SAGA review I have less harsh things to say. It's not to say that PAPER GIRLS couldn't eventually fall into the same traps that SAGA has, but at less than half as many issues released, it's much more difficult for PAPER GIRLS to feel too drawn out at this point. Although, there was part of me that rolled my eyes slightly at the last couple pages of issue #25. The girls have been thrown around in time for a long... time... now and I honestly need that gimmick to progress a little/lot. It's the same thing that drew me away from BLACK SCIENCE. These are not 1960 gimmick sci-fi shows. We can't wallow in the same premise for several seasons. I need the plot to progress and not reset every arc. The girls being separated in time is not a large enough departure from the girls being lost in time for me to be excited about it. Vaughan does a great job with the little details. He created a language for the future people that is a mix of txt language and slang. A slanguage as it's wonderful put in the comic. He has also managed to build in enough characters that currently the comic feels densely populated. 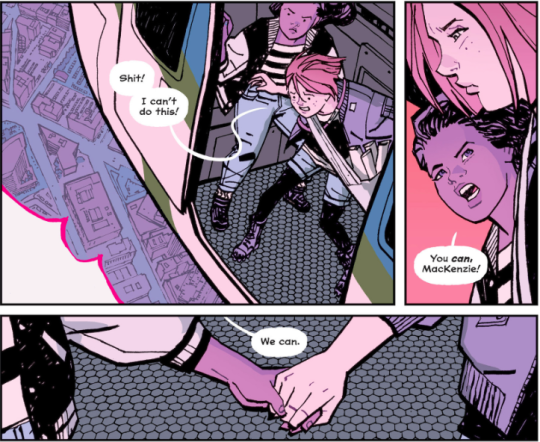 Sure, a lot of those characters are future versions of the papergirls themselves, but still. Most importantly, however, the girls themselves feel both relatable and accurate. Their teen angst, confusion, desires, all feel real and it's their dynamic and friendship that bring me back to this title each issue. If they were too antagonistic with each other, or felt like they used buzz-words from 1988 in a forced fashion, or other endlessly common problems that can be found when writing a gang of teenagers, this comic just wouldn't work. It's the humanity in this sci-fi story that is ultimately important, as it should be. There is a problem, as there is with all fiction written with time-travelling devises, of large chunks of this not adding up if you think about it for a couple minutes. I recently had a long conversation with my wife about the parts of BACK TO THE FUTURE that don't work because of paradoxes and such and yeah, it's true, but sometimes you just have to turn that off in your head to enjoy the ride. For example, why doesn't future Tiffany remember seeing herself die? It's because you have to try and explain this stuff away with the idea that any time-travel is really dimension travel but because of that, something happening to 1988 Tiffany shouldn't be of consequence to future Tiffany but that's not how this story is playing it all out and... this is exhausting. So yeah, I'll give those sort of inaccuracies a pass. 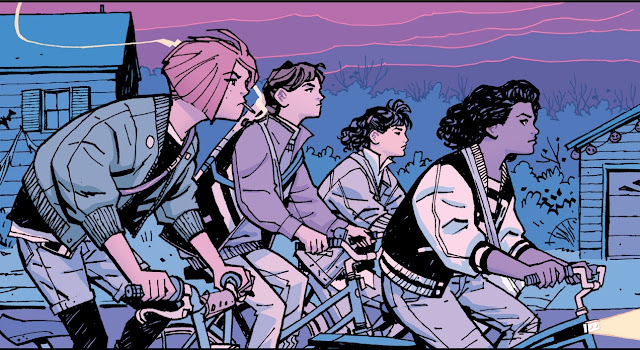 Overall, yeah, PAPER GIRLS is a great sci-fi adventure comic about friendship and growing up but it's in danger of that great comic getting a little lost in the time-travel part of it and I hope it can lean in to the former rather than the latter in future issues. Huh... get it?